Business cards, round corners, they go together like peanut butter and jelly. Smooth and sweet, and most everybody likes them. The options for custom printed business cards with PFL are limitless. We provide unusual and custom sizing, die-cuts, embossed, de-bossed, foil finish, metallic inks, pop-ups, double-folds, specialty papers, including plastic, and yes, we even have rounded corner business cards! Custom Choices: You can choose which corners to round! You can have one, two, three or all four. The corners can have a radius of 1/4" or 3/8". Be creative with your design! Budget Friendly: Achieve a specialty, sophisticated look without the added expense some other custom elements come with. Durability: Rounded corners prevent the worn-down look many cards get with heavy use, prolonging the newer appearance of the card. Higher Presentation Value: Rounded corners provide a sleek, modern aesthetic, with a classy and professional look. Stand Out From The Norm: Be memorable and provide tactile interest. Variable Data Available: We can print your rounded corner cards with variable data giving you even more options in marketing yourself and your company. Double-sided Print: You can get more vital information on your card and even include a call to action with double-sided printing. As an industry leader, we provide you with fast turn-a-round, commercial quality, and nationally recognized expert customer service! All of our business cards are shipped in transparent, easy access, 100% recyclable plastic boxes that provide shipping and use protection most other companies do not provide. All our cards come with free High Gloss Aqueous coating. 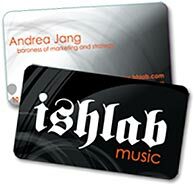 Rounded corners are not a new concept, but they are definitely one of the best, most cost effective ways to upgrade a traditional business card. We invite you contact one of our friendly print experts to help you get the business cards you envision, rounded corners and all. So, what do we do with the rounded corner shavings? Why recycle them, of course! As always, PFL is your answer for not just expert, commercial, quality-printed business cards, but we are a planet friendly company. All of our inks are vegetable based, our papers are recyclable, and we are 100% wind-powered. Round corners are available in several sizes and you can round from one to all four corners. Vertical business cards look great with from one to four rounded edges. to help you design and layout your own business cards.